Carlsbad Caverns (a.k.a. Carlsbad Cavern) in southeastern New Mexico, USA, is one of the world's most spectacular caves. The speleothem is abundant, large-scale, and magnificent. It has one of the largest cave rooms anywhere on Earth (the Big Room - 14 acres in size & a maximum height of 370 feet). The geologic origin of Carlsbad Caverns (& nearby Lechuguilla Cave) is unlike that of most caves. 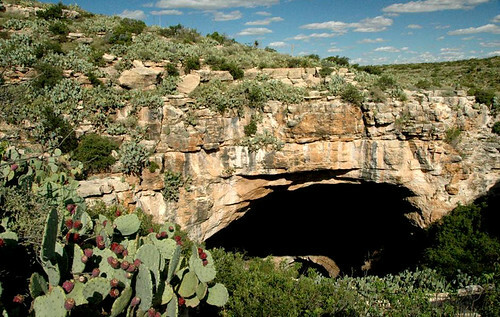 The cave is developed along the crest of Carlsbad Ridge, which is part of the prominent Guadalupe Escarpment, a long, northeast-to-southwest trending mountain range extending from southeastern New Mexico to western Texas. The natural entrance to Carlsbad Caverns was discovered in the late 1800s. Smoke was seen rising from the ridge at sunset. Close inspection revealed that the smoke was millions of bats flying from the mouth of a cave (www.nps.gov/cave/planyourvisit/images/bat_flight_hristov_...). The site was first called Bat Cave. The rocks surrounding the cave mouth are Permian backreef dolostones of the Tansill Formation (upper Guadalupian Series, mid-Upper Permian). Cave swallows are commonly seen here in the daytime (www.camacdonald.com/birding/CaveSwallow(JPP).jpg). Near sunset, the swallows disappear just before the bat flight. The most common species is the relatively small Mexican freetail bat, Tadarida brasiliensis mexicana (Saussure, 1860). More than 8 million bats occupied the cave in early days, but the population is now down to an estimated 250,000-300,000 individuals.